The charging order prevents a judgment creditor from foreclosing on the debtor’s interest, exercising control or compelling distributions. The rationale for a charging order is to prevent the other members in the LLC (or LP) from having to deal with an unwanted creditor as a new partner. But what if there is only one owner, as in a one member LLC? There are no other partners to protect. This is not the first attack on single member LLCs. A 2003 Colorado bankruptcy case, In re Ashley Albright, allowed a bankruptcy trustee to take control of a one member LLC. Cases in Kansas and even Nevada have followed this decision in bankruptcy court. Again, the logic was the same: There were no other members of the LLC to be affected by having the trustee act as a member. When there is only one member there is no second member to protect. In the chart below, in Attack #1, a tenant falls at the duplex and sues. The claim must be brought against the LLC. Whether it is just a one member LLC or a multiple member LLC does not matter. The claim is against the LLC and the member’s (or members’) outside assets are protected from the tenant’s claim. In Attack #2, the member gets sued in a car wreck, which has nothing to do with the duplex. 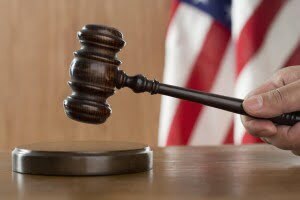 The judgment creditor seeks to collect for his injuries by reaching the duplex. The charging order in many states allows the judgment creditor to only receive distributions from the LLC, as opposed to forcing a sale of the duplex. 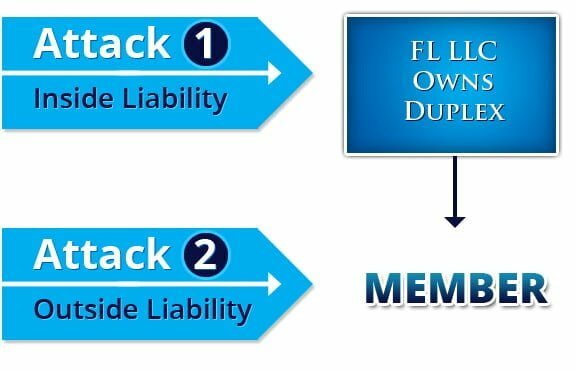 But now in Florida (as well as by case law in California, New York and Georgia) that judgment creditor can reach the duplex if it is held by a one member LLC. The first, and most obvious, strategy to deal with this is to avoid using one member LLCs. Grant 5% (or more) to a family member or trust and operate as a multi member LLC. You may want to allow the second member to participate in management and distributions so that they are more than just a nominal member. If the Florida LLC gets sued by a tenant, it doesn’t matter if it is a multiple or one member LLC. The claim is against the LLC, not the member. If the member gets sued, as in Attack #2, Wyoming law will apply and a one member LLC is protected. Still, you must follow the corporate formalities to be protected, even in Wyoming. In the Greenhunter case the Wyoming Supreme Court pierced the veil of a one member LLC for a failure to be properly capitalized, a key corporate formality. As in our first strategy above, include a second member to the Wyoming LLC. 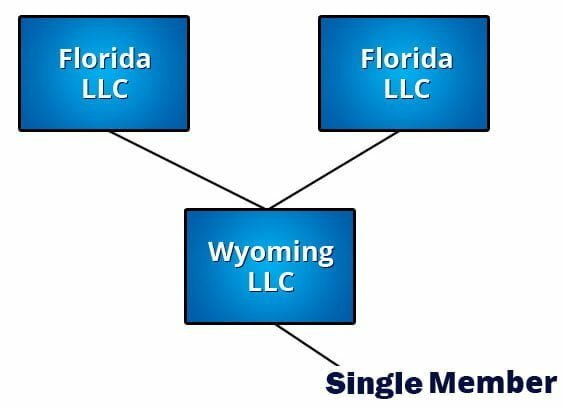 If Florida law is somehow applied to the Wyoming LLC, you will have two members and the charging order protection. The law is a dynamic and ever-changing area. You need to keep up with all the changes. Feel free to call our office at 800-700-1430 for more information.